Today I'm happy to be welcoming Melanie Rachel back to the blog. Melanie has written a Pride & Prejudice variation; Drawing Mr Darcy: Sketching His Character, which is published in two parts due to the length of the story. I have read part one and will be sharing my review of it here. Melanie is also offering a giveaway of the book! Read on for more details. When Thomas Bennet's childless aunt and uncle ask that one of his five daughters come to stay with them, he knows just which girl to send. Bright, energetic, and endlessly inquisitive, his little Lizzy is poised to become the apple of her father’s eye and the target of her mother’s fears. Neither will promote family harmony. When she returns to Longbourn as a young woman, Elizabeth Bennet Russell has had an unconventional upbringing. She is in possession of an important name, a fine education, a good fortune, and a love of drawing. When her parents ask her not to use her Russell surname while she is home, she reluctantly agrees. After all, nobody she knows will meet her in Hertfordshire. Drawing helps Elizabeth to literally sketch people’s character, and she’s become rather good at it. But she’s about to face her greatest challenge yet. Netherfield Park is let at last, and her good friend's much older brother--whom she has yet to meet--has arrived as a guest. 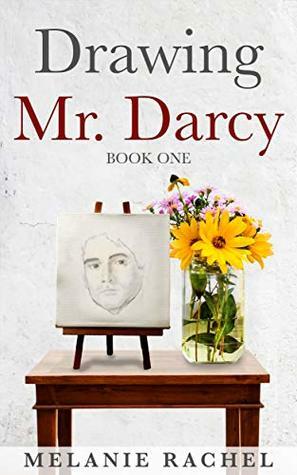 It will take Elizabeth more than a drawing to help her understand Mr. Fitzwilliam Darcy. Recently we were joined by Robin Kobayashi for a guest post and giveaway from her book Twelfth-Night Cake and the Rosings Ghost. This is a book focussing on Colonel Fitzwilliam, from Pride & Prejudice, who here has a small daughter. You can read Robin's guest post here. I will contact those of you who I have details for immediately on publishing this post. If I don't get in touch please contact me. 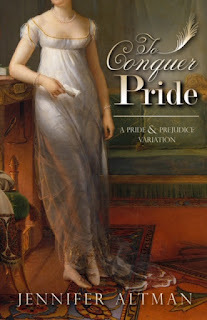 Recently I was joined by Victoria Kincaid who explores an interesting premise in her latest Pride & Prejudice variation. 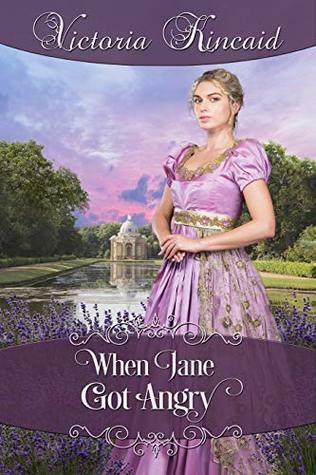 What if perennial nice girl Jane Bennet got angry? You can read an excerpt of Victoria's book, When Jane Got Angry, here. Congratulations to you! As you very kindly left me contact details I'll drop you a line. Thanks to everybody who commented, and of course, huge thanks to Victoria for the giveaway. Today I'm welcoming a new visitor to the blog. Robin Kobayashi has written two young adult novellas featuring characters from Pride & Prejudice. This latest story, Twelfth Night Cake and the Rosings Ghost is set in the festive season. Robin has stopped by with an excerpt of the story and the chance to win an ebook! Read on for more details. In this Christmas novella set in the year 1818, a plucky little girl must contend with a mischievous ghost at Rosings. Colonel Fitzwilliam and his eight-year-old daughter, Sofia-Elisabete, pass a winter’s month at Rosings, the estate of his aunt, Lady Catherine. There, the Colonel must help his illegitimate child, who is half-British, half-Portuguese, navigate the prejudices of their world as his outspoken daughter clashes with the imperious Lady Catherine. One evening, on the first day of Christmas, they hear the tale of the mysterious Rosings Ghost who, centuries ago, vexed the inhabitants of Rosings during the twelve days of Christmas. The next morning strange things begin to happen. Why has the Rosings Ghost returned now? Why does a furious Lady Catherine blame Sofia-Elisabete for all of the ghost’s pranks? Will our girl hero Sofia-Elisabete, with the help of her father, uncover the real secret of the Rosings Ghost and put an end to its tricks? What other choices had he made in his lifetime? And which ones did he regret, particularly those made during a time of war? If he rose to the rank of colonel or lieutenant colonel, he must have seen some military action. So, I placed him in Portugal when Napoleon’s army is about to invade that country for taking sides with England. In Lisbon, he meets a beautiful Portuguese girl, and that’s when Sofia-Elisabete, his illegitimate daughter, is conceived. 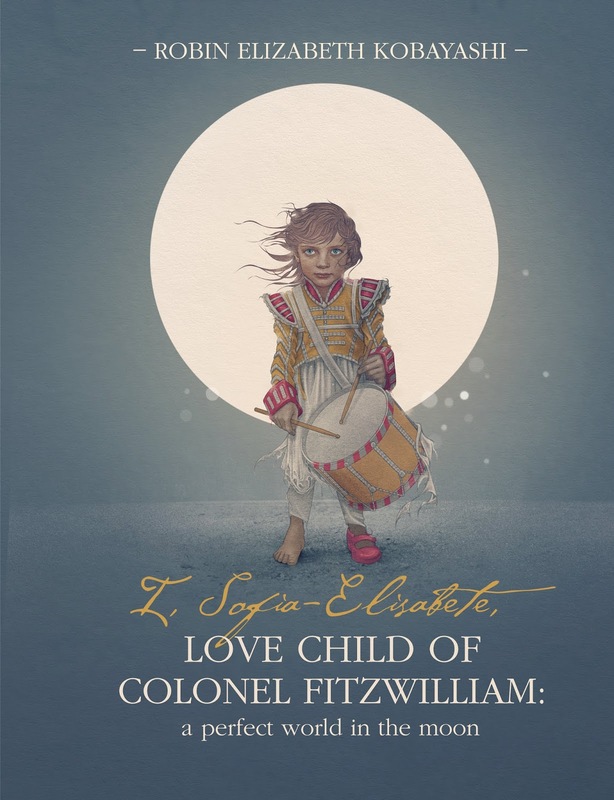 My novel I, Sofia-Elisabete, Love Child of Colonel Fitzwilliam: A Perfect World in the Moon, which is told from Sofia-Elisabete’s point of view, describes in both a humorous and poignant fashion her beginnings as an abandoned foundling, her search for her father and their close relationship when she finds him, and the tragedy that occurs when, at the age of five, she runs away from home to find the perfect world in the moon – a utopia that she believes will cure her father’s bouts with melancholy. After finishing the novel, I wanted to know what happened to these characters of Sofia-Elisabete and the colonel. Sofia-Elisabete, who is half-Portuguese, Catholic and a love child, is very much an outsider. How does she feel growing up in England during the Regency Era? Her father, who adores her, refuses to hide her in the countryside, to be brought up by strangers. 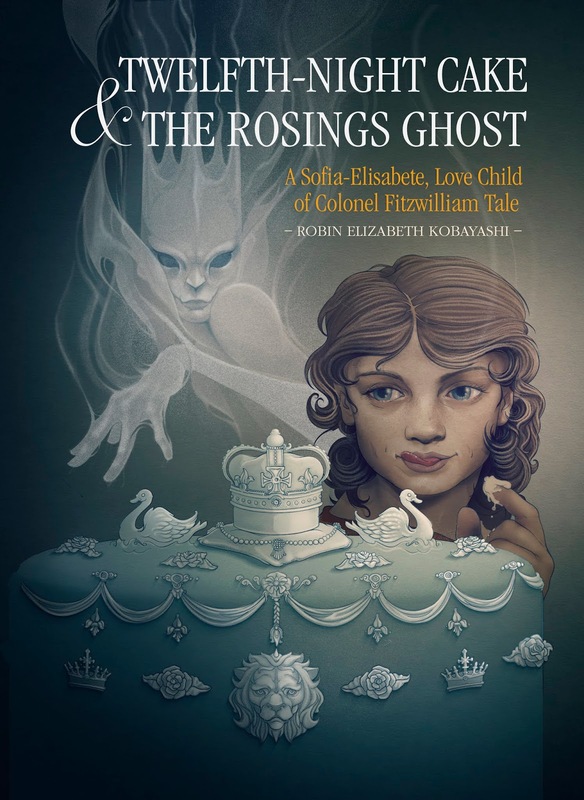 In my novella Twelfth-Night Cake & the Rosings Ghost, I imagined how the bold and outspoken Sofia-Elisabete would clash with the bold and outspoken Lady Catherine at Rosings. And all this clashing would take place during the Christmas season, a time of peace and goodwill to all people. But the colonel and his daughter aren’t the only two visitors at Rosings. The Rosings Ghost has returned; a ghost that very much enjoys playing pranks! Lady Catherine, who doesn’t believe in the Rosings Ghost, blames Sofia-Elisabete for everything that goes wrong. What’s a young eight-year-old to do? This past year I’ve been immersed in writing YA historical fiction that appeals to all ages, finishing three novellas about the lovable, strong-willed Sofia-Elisabete and her close relationship with her father, Colonel Fitzwilliam. Twelfth-Night Cake & the Rosings Ghost is the first novella to be released in this series. My sincere thanks to Ceri for helping me launch the Rosings Ghost novella on her site! Lady Catherine, who calls Sofia-Elisabete ‘the little brown one’, is making our girl hero eat tasteless gruel as punishment for taking her ladyship’s candy to give to the poor children. Hungry as ever, Sofia-Elisabete gulps down the remains of Anne de Bourgh’s chocolate. She wonders why her color matters. She never thought of herself as a color before. Towards the end of this scene, she questions the colonel about her brown-tinged skin. On my third and final day of eating cruel gruel, which is how I dubbed it, I got it into my brain that my own suffering would no longer do. Breakfast over, and no one attending to me, I seized Annie’s cup of chocolate and, quick, quick, quick, I slurped up what remained in it. Now, most mornings after breakfast, Annie would hie to the stable to call on her beloved ponies, Sylvester and Macdougal, and she, being an eccentric, would kiss them and slobber them and talk like a stable boy to them and rub them down with fresh straw. I hear you cry, ‘Surely you are funning?’ I own that I had spied on her the other day. Having burst into giggles at her silliness and stable-boy talk, I was found out and banished from the stable. Feeling emboldened by my chocolate caper to-day, I sneaked into the stable where I eavesdropped on Annie’s conversation with her ponies. She told them how naughty I had been. She growled like a dog at my ‘gggrruel punishment’ – a wit she is not – and how I needed to be taught a lesson for having done a bad thing, a very bad thing by stealing Lady Catherine’s medicinal drops. ‘She be a bad ’un. A’n’t I right, Sylvester? You knows I am.’ She fed a carrot to her pony. Well, I never! I waited for Annie to quit the stable, and that’s when I pilfered her prized driving-whip. One of the ponies stamped his hoof in protest. ‘Shush, Macdougal,’ warned I, shaking my finger at him. The sun in a cloudless sky had begun to melt the thin layer of frost on the ground. I sallied forth to the garden; from there, I bounded down the sloping lawn to reach the meadow land, my very own secret meadow. I pranced about, cracking the long whip – crac crac – again and again and again. I imagined myself atop a gleaming barouche, driving four-in-hand, my team of chocolate unicorns galloping to the great beyond. ‘Gee up! Awhi! Awhi!’ shouted I, mimicking a driver. Unbeknown to me, papai had sighted me from a window at the manor-house. What a strange scene I must have presented to the servants, leaping about and crac-crac-ing my whip and taking a tumble now and then on the slippery ground. But papai was used to my peculiar ways. He strode out across the brown meadow to join me. Having heard papai’s approach, I spun round to face him, my countenance flushed with exercise. ‘Papai, I’m driving a barouche and four with chocolate unicorns.’ He slowed his step in a most quizzical manner. ‘Come here, silly gooseberry,’ ordered he with an outstretched hand. But I sensed a trace of trouble on his face. Would he lecture me about my hoydenish ways? I stepped away from him. With mingled feelings of childish panic and impish glee, I darted off like a hunted hare, doubling and turning. ‘Ha! Ha!’ I, the prey, taunted the hunter. But I was no match for a keen sportsman like my papai, who seized me by the back of my unlucky scarlet cloak and thereafter confiscated the driving-whip, scolding me that it wasn’t a toy and that I could hurt myself or someone or something. ‘Methinks it’s mud.’ I felt my soiled pinafore. It has long been a maxim with imps like me that one must always answer a question with another question to get oneself out of a scrape. And if one is very lucky, the all-knowing grown-up will have forgotten his question by then. ‘Papai, am I as brown as chocolate?’ I peered up at him with the saddest eyes I could muster. I sensed his relief, he having summoned up a grin for me. I wondered why my milky tea-ness caused him to fidget. Did my brown-ness vex people for some reason? I thought about people colours – the milky-white young ladies, the scarlet-faced old men, the nut-brown farmers. My wee brain couldn’t make sense of why that sort of thing mattered. Papai strode through the meadow, his hands clasped behind his back, thinking many a deep thought, for a prodigious thinker he is. I ran alongside him, trying to keep pace with his manly stride. I clasped my hands behind my back likewise to summon up some deep thoughts of my own, as mine were always coming and going whenever they pleased. ‘Papai, I feel a deep thought coming round finally,’ said I with pride. And he laughed at me, wearing those sad, crinkling eyes of his. 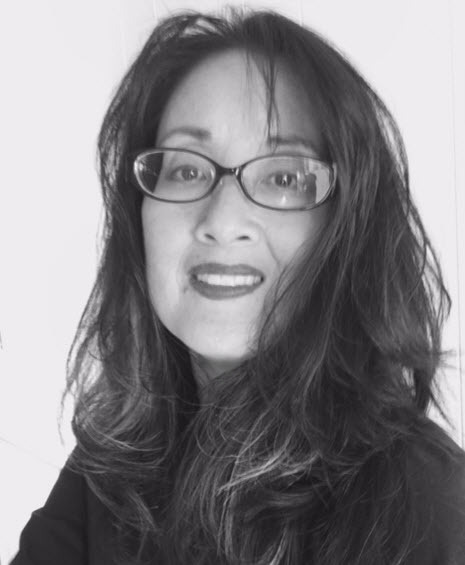 Robin Elizabeth Kobayashi is a native Californian who has lived in both Los Angeles and San Francisco. When she was twelve, she used to haunt the public library where they had a section of books called “Classic Fiction”. She made it her goal to read all of these books, starting with the A’s (Alcott, Austen), then the B’s (Brontë), but she got stuck on the D’s, because Dickens’ books were just so l-o-o-o-n-g in length. She never did finish her reading challenge. She never did understand Pride and Prejudice at the time; that would come much later. Fast forward several decades. After reading countless JAFF eBooks, many of them superb, she never thought she had a story to tell. Until one day she began to write about a half-Portuguese half-British girl living in the Regency Era. That novel, I, Sofia-Elisabete, Love Child of Colonel Fitzwilliam: A Perfect World in the Moon, received a starred review from Kirkus Reviews which also selected the novel as an Indie Best Books of the Month (August 2018). During the day, she works as a senior legal writer and editor for a leading global publisher. Robin is kindly offering to give away 5 ebooks to visitors of Babblings of a Bookworm! To enter, just comment on this blog post before the end of the day on Monday the 19th of November. Please leave a way for me to contact you in case you are a winner. 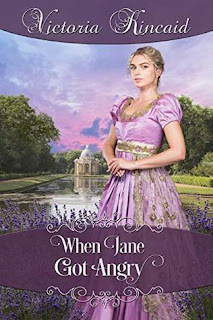 Today I'm welcoming Victoria Kincaid back to the blog with her latest book, When Jane Got Angry. 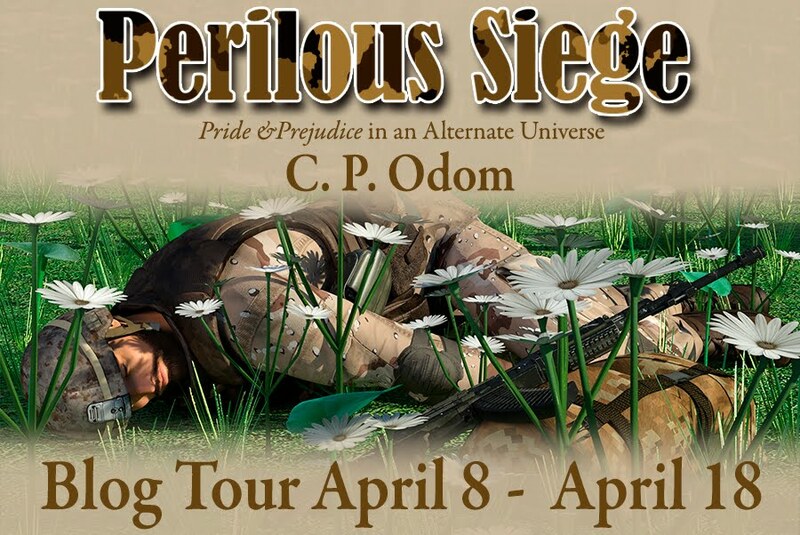 Victoria is bringing us an excerpt of the book, plus a giveaway to a commenter on this post. Let's read the blurb and then I'll hand over to Victoria. When Mr. Bingley abruptly left Hertfordshire, Jane Bennet’s heart was broken. 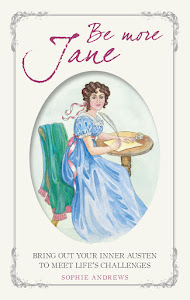 Since arriving in London to visit her aunt and uncle, Jane has been hoping to encounter Mr. Bingley; however, it becomes clear that his sister is keeping them apart. But what would happen if she took matters into her own hands? Defying social convention, she sets out to alert Mr. Bingley to her presence in London, hoping to rekindle the sparks of their relationship. Bingley is thrilled to encounter Jane and renew their acquaintance, but his sister has told him several lies about the Bennets—and his best friend, Mr. Darcy, still opposes any relationship. As Jane and Bingley sort through this web of deceit, they both find it difficult to retain their customary equanimity.